I always try to resemble my Mom's Modak recipe, especially the one she cooks on Ganesh Chaturthi. 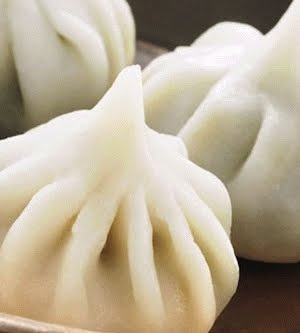 Modak can be considered as a sweet dumplings. The are stuffed with filling of coconut and jaggery. Famous in western and South India. 1. In a non-stick pan, add grated coconut and jaggery and cook over a slow flame till the jaggery melts and the mixture comes together. 2. Add the cardamom powder and mix well. 3. In another non-stick pan boil the water. 4. Add 1 teaspoon oil and a little salt in the boiling water and stir. 5. Reduce the flame, add the rice flour while stirring continuously. 6. Whisk well so that no lumps remain. Cover with a lid and keep aside for about 5 minutes. 7. Grease your palms with a little oil and knead the dough while it is still warm; if the dough cools it will get lumpy, if it is not kneaded. 8. You could even use a hand blender to knead the dough. 9. Make even size small balls of the dough (2 inch in diameter) using oil. 10. Then roll each of them into a round shape, 3 1/2" in diameter. 11. Make 8 to 10 folds in rolled dough with 1 cm. distance in between. 12. To make a fold pinch the outer line of rolled dough a little bit ahead making 1-2 mm thick fold. 13. Add a spoonful of the filling into the dough. 14. Bring all the ends together and press to seal. 15. Prepare a steamer by adding water, a teaspoon of oil and heat it till the water comes to a boil. 16. While the water is simmering, place the modaks on a greased steamer plate and steam for 6 to7 minutes. 17. Once the modaks are cooked they will turn translucent. 18. Serve hot drizzled with pure ghee.